FOR MANY IN THE MEDICAL FIELD, THE ultimate dream is the on-demand fabrication of a brand new heart. Click one button and a 3D printer intricately weaves a complex arrangement of cells and extracellular matrix. After the machine shuts down, you’re left with a brand new, healthy, blood-pumping heart. But that dream is far from reality. There are a number of hurdles scientists and researchers must overcome before we can entertain the potential of complex organ printing. The motivation for meeting these challenges comes from a wide variety of current needs: transplant organ shortages, strategies to assist and expedite drug screening, inadequate performance of current implantable devices, and other applications where functional human tissue is required. The motivation for my personal research comes from the challenges presented by treating congenital heart disease. Congenital heart defects are the most common birth defects, affecting nearly one percent of all births worldwide. Fortunately, many of the conditions that fall under this umbrella terminology are easily manageable, some requiring no therapy or corrective procedures whatsoever. But in other cases, the anatomical defects of the heart and vasculature are so complex, immediate and extensive surgery is necessary to restore vital blood flow through a patient’s body. Even in patients who share the “same” condition (such as tetralogy of Fallot), defect anatomies may vary greatly. Each heart and blood vessel structure is unique, and the corrective procedures to fix these issues can become complex. There are several major issues with current corrective procedures. First, surgeons must often use vascular grafts (artificial blood vessels) from a selection of premade devices. Once the patient is being operated on, the surgeon must cut and fit the grafts during the procedure. While these grafts are generally successful, they are permanent, synthetic grafts. This means the implanted artificial vessels cannot grow as the patient grows. As the child grows, the grafts must be replaced for appropriately sized conduits. In addition, though they provide restored blood flow, the grafts don’t always integrate well with the host’s tissue. This means complications may arise from blood-material interactions (blood is a finicky substance and tends to react with everything), and the grafts may clot or cause progressive obstructions. Despite these setbacks, the long-term prognosis for these patients has drastically improved as surgical techniques have been honed and medical devices improved. But we can do better—which is where my work as a bioengineer comes in. The concept and practice of 3D printing has been around for several decades, but is just now receiving increased attention for its applications in medicine. Unlike a certain “Grey’s Anatomy” episode that would have you think otherwise, there isn’t an FDA approved implantable 3D printed device on the market for blood vessels or cardiovascular structures of any kind, much less anything to treat congenital heart disease. However, this past year saw a monumental breakthrough in 3D printed devices. Oxford Performance (OPM) materials received FDA approval for its Osteofab Patient-Specific Cranial Device. This device centers on 3D reconstruction of complex craniofacial parts like cheek and jaw bones. By utilizing reconstructed medical imaging data from patients, OPM can 3D print a custom part made from a polymer—or plastic—they developed for craniofacial reconstruction. Bear in mind, this is an entirely non-cellular construct. It is permanent, non-growing, and is used to repair defects where bone should be. In the realm of cardiovascular devices, we’ve started to adopt 3D printing technologies in other ways. Already, teams of engineers, medical imaging technicians, and clinicians have adapted 3D printers, hardly different than the ones available to consumers, for the purpose of pre-surgical planning. Before 3D printing, the surgeon or team of surgeons preparing to correct a cardiovascular defect would rely on images obtained through magnetic resonance imaging or computer tomography. Essentially, these techniques take a series of cross-sectional images of the area of interest. These layers are then stacked to construct a 3D model of the patient’s anatomy. Clinicians can view these reconstructions on a computer monitor to get a better sense of what the cardiovascular architecture is like. However, even with these reconstructions, you can only view a single 2D plane at a time. Sure, you can rotate the model on the computer screen, but all you can see is one cross-section, one plane of the 3D model. With 3D printing, it is a whole new dimension. Hospitals equipped with this technology can provide their clinicians with a valuable service. Doctors and surgeons can have a plastic 3D model printed. Often, the technicians and engineers working with the 3D printers will segment the models into pieces, similar to a Lego set. Clinicians report holding these models in their hands and seeing them in three-dimensional space provides a better representation of what they should expect once in the OR. Not only can surgeons better examine the anatomy, but they can also practice surgical procedures, and size devices appropriately for implantation. These 3D printed models can be an enormously useful tool for improving surgical outcomes and anticipating problems that may arise during surgery. In one extreme case study, my collaborators at the Children’s National Medical Center in Washington, D.C., used medical imaging data to reconstruct the complex anatomy of a set of conjoined twins. They printed plastic models of the twins’ internal anatomy. The 3D model accurately depicted the complex latticework of individual blood vessels among the shared organs, which the team of surgeons used to decide how best to divide the twins’ organ structures. The separation was a resounding success, and the surgeons agreed having a plastic 3D printed model greatly bolstered their ability to perform this complex surgery. But despite pre-surgical planning and OPM’s 3D printable craniofacial reconstruction polymeric material, 3D printing has yet to revolutionize medicine in the clinic. Many of the field’s implantable therapeutic applications are still in development, and most of this research is taking place in university and government research labs. There are two major strategies for 3D printing implantable devices. The first strategy relies on the custom fabrication of biocompatible polymer components. In other words, researchers use 3D printing to make patient-tailored devices out of non-cellular materials. This strategy offers several benefits. As with all 3D printing techniques, medical imaging data can be used to improve the custom design of whatever tissue or organ needs to be replaced. A device that doesn’t involve biological components also allows a potentially quicker route to FDA approval. Regulatory approval is one of the major stumbling blocks for medical technologies, and an entire book could be written about the subject. So we won’t delve too far into that rabbit hole—you’ll just have to take my word for it that involving living cells substantially complicates the approval process for any medical device or therapeutic. At its most basic level, this non-cellular printing is used to make a device that is designed to accomplish its desired task with minimal biological interactions. This is the case with OPM’s OXPEKK® material. Once the artificial piece of skull or jawbone is printed and implanted, it becomes a permanent fixture of that person’s anatomy without prompting a major reaction from neighboring cells or tissues. However, non-cellular printing techniques are not always designed to avoid cellular interactions. Some 3D printable devices serve as what we call scaffolds. Similar to how scaffolds are used in the construction of buildings by providing structural support, scaffolds in bioengineering provide support for the growth of new cells and tissues. In your body, cells naturally produce their own complex scaffold of proteins and other molecules. This is called extracellular matrix (ECM). ECM also provides crucial contextual signals to cells by activating signaling pathways that directly affect cells’ functions, proliferation, and migration within tissues. Laboratory research proves time and time again that the components and structure of this scaffold are crucial for cell and tissue regeneration. With the technical capabilities of precise scaffold architecture design, 3D printing is an important tool for designing an artificial platform to encourage cell and tissue growth. This has opened the door to strategies like that of my own research. In my lab, we’ve developed a non-cellular 3D printable biomaterial suitable for replacing cardiovascular tissues. The material can be used in an industry standard 3D printer to produce custom-designed scaffolds with microscale features that encourage cell growth and tissue formation. Once implanted, these scaffolds degrade over time and allow the host’s natural tissue to take over the form and function of the implant. Our overall goal is to use medical imaging technology to capture a congenital heart defect in a patient, model a device to correct the implant in 3D modeling software, and then print the resulting design. There would be no further steps other than sterilizing the device before implantation. Because the devices degrade and are replaced with natural tissue, the complications associated with follow-up surgeries to replaced failed or outgrown devices would be minimized. A second strategy takes this non-cellular strategy a step further. Like before, a non-cellular scaffold may be printed from a synthetic or naturally derived polymer. After fabrication, cells are seeded on the scaffold. A researcher or lab tech then cultures the cell-laden scaffold in appropriate environmental conditions. Usually, this takes place in what is called a bioreactor. The bioreactor provides a temperature and biochemically controlled environment. It may also impart fluid flow or other mechanical stresses on the bioprinted scaffold to induce cellular responses. This conditioning ensures the cells and tissues are properly adhered to the scaffold and differentiated into healthy, mature tissues primed for implantation. There are a number of critical areas requiring extensive research and development before 3D printed tissues become a viable clinical therapy. I’ve previously alluded to one of the major issues with bioprinting. While we know that the ECM is critical for healthy tissue development, we don’t have a complete grasp on exactly how this 3D microenvironment, with all its biological, chemical, and structural cues, operates. Understanding the interplay between hormones, soluble proteins, components of cellular membranes, biomechanical factors, local oxygen concentration, and a host of other variables may prove critical to reconstituting healthy organ tissue from a bioprinter. Thus, it may be difficult to adequately design a printing system that can fabricate a perfectly functioning tissue or organ on demand. Instead, current trends in research point to utilizing the self-assembling nature of molecules, and molecular aggregates, that cells participate in naturally. These functions may involve the use in printing of “bio-ink.” Bio-ink is a mixture of cell aggregates (specific cells depend, of course, on the desired tissue being fabricated) and may include biocompatible polymer or ECM components like collagen, gelatin, and others. If a bio-ink is developed properly, these cell aggregates could be deposited and cultured to induce self-assembly of the cells into tissue constructs. Most research points to this multistep process of organ fabrication. The first phase would entail the harvesting and culturing of cells. This may be from a native stem cell source (like bone marrow), donor tissue, or induced pluripotent stem cells (fully differentiated adult cells that have been genetically altered to revert to a stem cell phenotype). These cells would need to proliferate over time to have sufficient numbers for the printing process. Then they would be isolated and aggregated into a bio-ink. 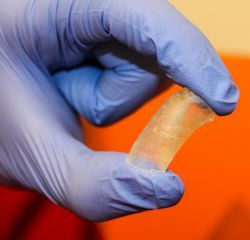 Following the 3D printing with the bio-ink, the resulting tissue construct or organ would need to be cultured again to allow the self-assembly of the cellular components into a mature, healthy organ with full physiologic function. Still, even if self-assembly were to fill in the blanks of biology that we still don’t completely understand or can yet replicate, there is another major challenge: vascularization. Oxygen and nutrient delivery, along with waste removal, are integral to cell survival. Normally, oxygen and nutrients can only penetrate 200 to 300 microns of tissue. Without the complex network of highly organized vessels that exist in our tissues, cells would perish. The biology of growing vessels (you’ll see a trend here) has been somewhat, but not completely, duplicated in the laboratory. Researchers have 3D printed functioning blood vessels with diameters of a couple millimeters. But between the current lack of hardware and bio-ink capabilities, there hasn’t been any success directly printing the capillary networks of vessels with diameters on the microscale necessary to “feed” growing tissues and organs. The development of either direct printing of a microvascular network or spontaneous growth of such a network must be accomplished before vascularized organs like hearts, kidneys, lungs, and even bones stand a chance of being adequately bioprinted. If you sense a growing theme in bioprinting research, it’s that our efforts have largely centered on mimicking Mother Nature’s work. We do our best in the lab to recreate the biological products from millions of years of evolution. Yet who’s to say Mother Nature really knows what she’s doing. After all, we have a tailbone we don’t need and an appendix we could do without. There are a mess of genes in our DNA that our cells don’t even bother to “turn on” as they’re nothing but remnants of our primordial past. I’ve met researchers in bioprinting who’ve stated they don’t think we’ll ever actually bioprint a fully functional human heart. Yet these individuals also claim it may not be necessary. For example, researchers and engineers have been developing and implementing designs for total artificial mechanical hearts since the 1950s. Much of the research focused on mimicking the pulsatile flow created by the human heart. This pulsatile flow of blood through the constant rhythmic motion of the heart chambers and purging of blood through valves gives us our heartbeat. While the human body has functioned for eons with this pulsatile pump, recent artificial heart designs have proposed continuous circulation of the blood. This eliminates the need for heart valves, but more importantly introduces a paradigm shift in the way we think of medical devices. Rather than try to fabricate and implant an organ exactly like the one that failed, why not replace the malfunctioning organ with an entirely different, potentially better, more elegant design? Bioprinting may not simply be a way to reproduce human organs. It may be the key to designing better ones. We’re at least a couple decades away, given the sheer amount of research and regulatory hurdles this technology may face. Still, the innovation enabled by bioprinting will be especially useful in those who aren’t born with functioning organs in the first place. For children suffering congenital heart defects, for example, an improved bioprinted heart may not only correct their defects, but leave them better off than the rest of us with our “normal” organs. Anthony J. Melchiorri is a biomedical engineer, working on tissue engineered blood vessels for children with congenital heart defects. When not in the lab, he writes successful science fiction, having published more than five novels.